Thank goodness for citrus in the winter. My dessert menus at the restaurants need some color and bright flavors. It even brightens up the pastry department and our moods. You can only handle so much rain and this week it’s not supposed to stop. I am not complaining about brown desserts as chocolate, caramel and nuts are all shades of brown but I need something to break it up. Ordinary oranges, limes and lemons are available as always but January also brings Meyer Lemons, Cara Caras, blood oranges, mandarins and kumquats. These varieties are only around now for a few months so take advantage of them while you can. Cara Caras are very juicy pink fleshed navel oranges. They segment nicely for a plated dessert or served on top of cheesecake. Blood oranges (also known as Moro Oranges) with their deep red color are originally from Sicily and common all over Italy. They make great sorbet. Both of these oranges are grown by Sunkist so are available across the United States. 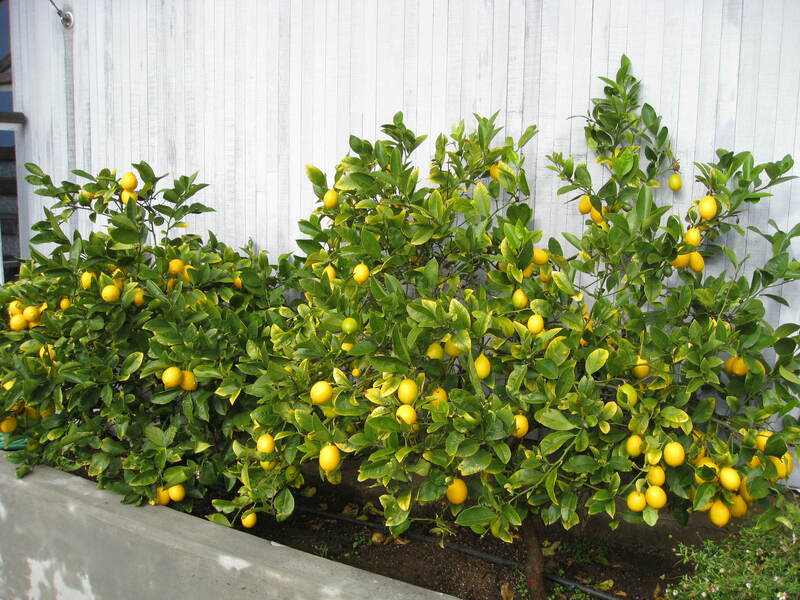 Meyer Lemons can be harder to find as they are not grown on a large commercial scale. In California they are called the backyard lemon as you can see the bright yellow fruit on trees in yards all over the Bay Area. I have nine small trees in the front of my house where the rhododendrons used to be. The lemons are a much better use of space. Only probably is I when I come up my driveway I love to see the trees full of lemons so I put off picking them. Cookbooks by California chefs call frequently for Meyer Lemons. This can be frustrating for people from other parts of the country as they can’t get them. (Last year I gave an East coast friend fifty Meyer Lemons for her 50th birthday.) Meyers are a thin skinned lemon thought to be a cross between an orange and a lemon. They are sweeter and less acidic than regular lemons. They work wonderfully in desserts. Sometimes I will add a little regular lemon juice to give Meyer lemon curd a little lemon kick. Here is my favorite recipe using Blood Oranges. 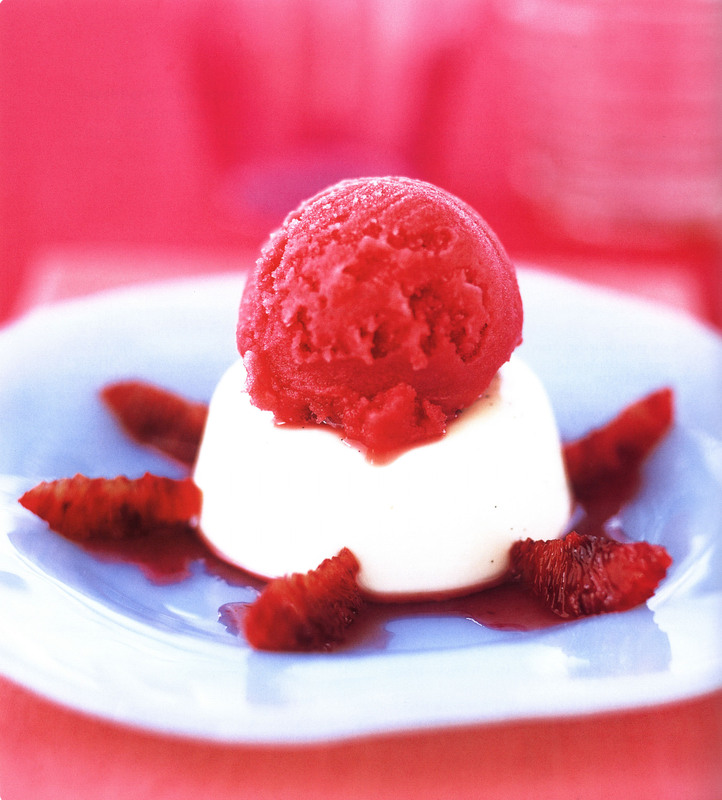 To make the sorbet: In a large bowl, combine the blood orange juice, sugar, lemon juice, and salt. Stir until the sugar dissolves. Refrigerate for at least 2 hours or up to overnight. Churn in an ice cream machine according to the manufacturer’s instructions. Freeze until scoopable, about 2 hours, depending on your freezer. To make the vanilla custard: Combine the vanilla bean, seeds, cream, milk, and sugar in a medium saucepan. Heat over medium heat, stirring occasionally, until almost simmering. Turn off the heat and cover the pan. Let the vanilla bean steep in the liquid for 10 minutes. Stir together the gelatin and the water in a small bowl. Let stand for 5 minutes. Strain the cream mixture into a bowl, discarding the vanilla bean. Stir the gelatin mixture into the cream with a heat-resistant plastic or wooden spatula. Let the liquid cool to warm, stirring occasionally, about 10 minutes. (Stirring prevents the gelatin from sinking to the bottom of the hot liquid.) Pour the vanilla custard into 6 ramekins. Refrigerate until set, at least 4 hours. To serve: Unmold by dipping the bottom of the ramekins in a bowl of very hot water. Run a knife around the inside edge of each cream and invert onto a plate. Arrange the orange segments around the creams. Place a scoop of sorbet on top of the vanilla custard. (You can also serve it in the dish if you don’t want to unmold it. Put the segments and sorbet on top.) Serve immediately. In Advance: The creams may be made a day ahead. Once firm, cover with plastic wrap. Teh sorbet can be made a day ahead too. I love blood oranges and especially Cara Caras. I’m always excited when I see them pop up at my local Whole Foods. This blood orange and vanilla creamsicle sounds delicious. I actually just cooked some vanilla custard to turn into ice cream tomorrow. I wish I had blood oranges on hand!